A couple of weeks ago, Atlassian published a blog post titled “4 Confluence add-ons to take your team’s collaboration to the next level”. In it, they described the add-ons they recommend the most for teams. SoftwareDevTools wants to take the opportunity to recap the 4 add-ons mentioned in their post and also recommend a few others that we love. We were truly excited to see our very own add-on, Agile Retrospectives for Confluence, featured in the list. Agile Retrospectives for Confluence enables teams to run engaging retrospective sessions inside the Confluence platform with a helpful Confluence template. Team members can simultaneously input their ideas on what went right and wrong during the sprint to discuss each topic and vote for the most important ones. This is a great Agile tool for Confluence. Once topics are discussed, action items are created collaboratively and assigned to the team members who will be in charge of executing them. At the end of the session, the team gets an easy-to-digest summary. Keeping track of the progress on actions items is easy. They can be filtered by resolved and unresolved items and also by team members assigned to tasks. This app was successfully launched and we received requests to build the same app for Jira. So we build the Agile Retrospectives for Jira app. A great tool to host Retrospectives inside you Jira projects. This add-on makes task management efficient and also enjoyable. It has a beautiful design and an intuitive UI that ensures teams can be up and running within seconds. Tasks are very collaborative and support comments, notes, checklists, tags, due dates and time tracking. By embedding projects on a Confluence page, teams can see dynamic tables complete with task statuses, assignees and links to the original tasks in MeisterTask. This add-on is perfect for managing customers inside Confluence since it enables you to keep your customer information close to your documentation. With Atlas CRM you can find all documents of a customer in one place, regardless of the space they are in. Refined Theme for Confluence gives you the power to control the look and feel of your Confluence spaces. It has pre-designed space templates you can choose from or you can create your own so it matches your brand. The best thing about it is that there’s zero coding required. Confluence add-ons we love and recommend! Scrum Poker Estimates is perfect for Agile teams who use the Planning Poker technique to estimate on their software development tasks! The perfect Confluence sprint planning tool. You can track your team’s progress and manage integrations using a simple dashboard. Plus, its JIRA Integration allows you to import your backlogs from JIRA and estimate them on your Confluence page. If you don't want to import your tasks to Confluence, and you'd rather have the estimation session directly inside your Jira project, we just created the Jira version for it: Scrum Poker for Jira. Very helpful for remote estimations, with all the features from Confluence and even more!. This add-on lets you create and share live roadmaps with just a few clicks. You can easily drag and drop boards, milestones, containers, and lanes to build roadmaps in just minutes. 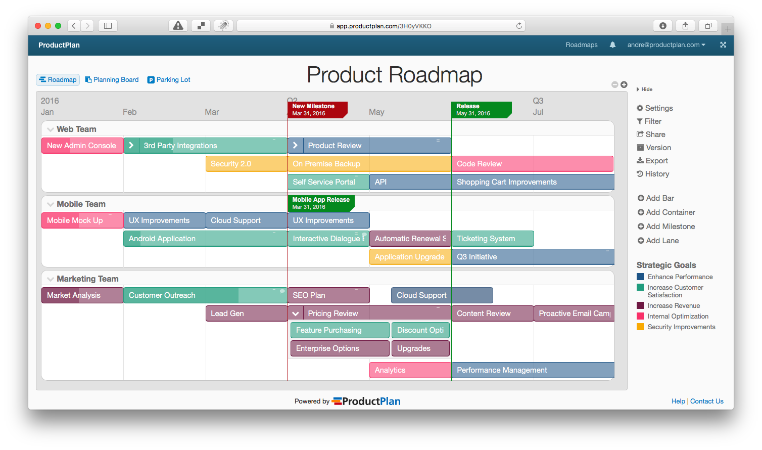 Roadmaps can be updated in real-time and easily embedded into Confluence to keep up to date. It's great for collaborating on UI specs on Confluence. Its editor enables you to create mockups and wireframes from scratch and save them to a Confluence page for the whole team to comment on. You can even co-design in real-time. Using any other Confluence Add-ons with your team? Let us know which is your favorite!